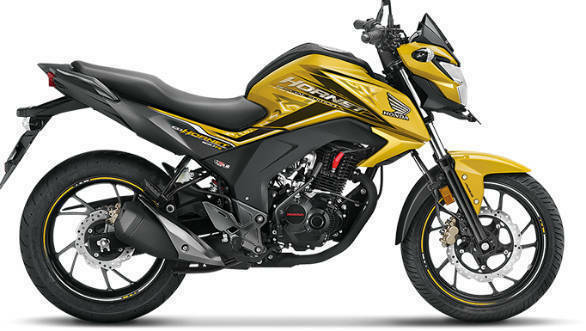 Honda has launched the refreshed CB Hornet 160R in four variants priced between Rs Rs 84,675 to Rs 92,675 (ex-showroom Delhi). The updated motorcycle was first shown at the 2018 Auto Expo and will start arriving at dealerships by early April, which is also when bookings begin. Changes include a new LED headlamp, new body graphics, more prominent Hornet badging and a redesigned instrument cluster housing with blue backlighting replacing the earlier amber. Another notable inclusion is the addition of an ABS-option on both STD and DLX trims at a premium of Rs 2,500. The bike will be available in five colour options. The 2018 CB Hornet 160R carries over its 167.2cc single-cylinder, air-cooled engine. The motor is good for 15.1PS and 14.5Nm and works in conjunction with a 5-speed gearbox. The Hornet sits on front telescopic shocks while the rear gets a mono-shock setup. The bike gets a standard front petal disc brake while a rear disc is available on the higher trim level. The Honda CB Hornet 160R competes with the recently launched TVS Apache RTR 160 4V, Bajaj Pulsar 160 NS, Suzuki Gixxer and Yamaha FZ-S FI. This segment has seen quite a bit of activity recently and with this update, Honda will be hoping to mount a stronger challenge to its competition.